In heraldry, it is told that left-turned and kneeled forms are coat of arms representing aggression. It is said that Christian church was a battle group challenging against infidels once upon a time, long time ago, so I think that Triskele used for church is counterclockwise because of that reason. 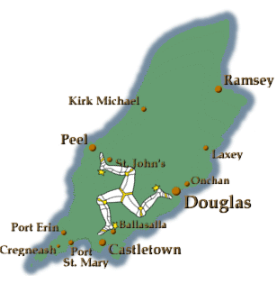 Also, the three knees point to the locations of the countries of England, Scotland and Ireland when they were independent kingdoms． It seems to be kneeling to these countries in a sense. However, no matter what posture it is, since one leg always kneels down, it is easier to keep balance, so you can see that the motto of "Wherever you can throw it always stands" will not collapse. and kneel down to England with the third one. In addition, it is said that Ghost appears in this island is limited to Douglas and Peel and Castle Town, and Triskele seems to point to these three towns, so the role of protecting the three cities Perhaps it is responsible. As you can see, three foot is designed in the direction pointing to each city. It is a major harbor and a place where built a castle. So, since these were also defense bases at the same time, cannot it be said that they were designed like this? Imagination and fantasies are not exhausted.